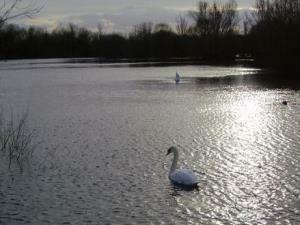 Chigborough Lakes01621 862960work Nature ReserveThis diverse site of 46 acres is managed by Essex Wildlife Trust. It consists of a series of flooded gravel pits giving a wide range of different habitats including open water, small ponds, marshy areas, grazed grassland and Blackthorn/Hawthorn scrub. Strolling through the reserve, there are a number of interesting flowers to look out for, including Common Spotted and Bee Orchids, Heath Speedwell, Common Storks Bill and Wild Strawberry. The reserve has eleven varieties of willow, including Almond and Purple Willow and several recently pollarded Cricket Bat Willows. Over 120 species of bird have been recorded, and more than 40 of these have bred at some time, including great crested and little grebes, kingfisher and water rail. Ruddy duck can be numerous when the water level is high. Sedge and reed warblers can be seen or heard in spring and summer, together with common whitethroat, reed bunting and willow warbler. This diverse site of 46 acres is managed by Essex Wildlife Trust. It consists of a series of flooded gravel pits giving a wide range of different habitats including open water, small ponds, marshy areas, grazed grassland and Blackthorn/Hawthorn scrub. Recently signs of Otters have been found on the reserve and it is also home to a number of Grass Snakes.